Would you like to offer your insights? I thought I’d have written at least a few articles about some of the individual Cosmic Tarot cards by now, but I haven’t felt strongly compelled to actually get to it. Obviously. I do think there is a need for a really good, English, Cosmic Tarot guide. There is a lot to see and understand in each card of this special deck and not nearly enough guidance to access that depth and wisdom. Is it something you might be up to? While I may not feel up to doing the thinking and writing right now, I do like editing and working on anthologies — so I’d be very happy to receive submissions and post them here. If you have an insight into any of the Cosmic Tarot cards that you’d be willing to write up and submit, I’d love to hear from you. And while we’re talking about editing… I’d like to introduce a book I worked on last year as the editor and designer. 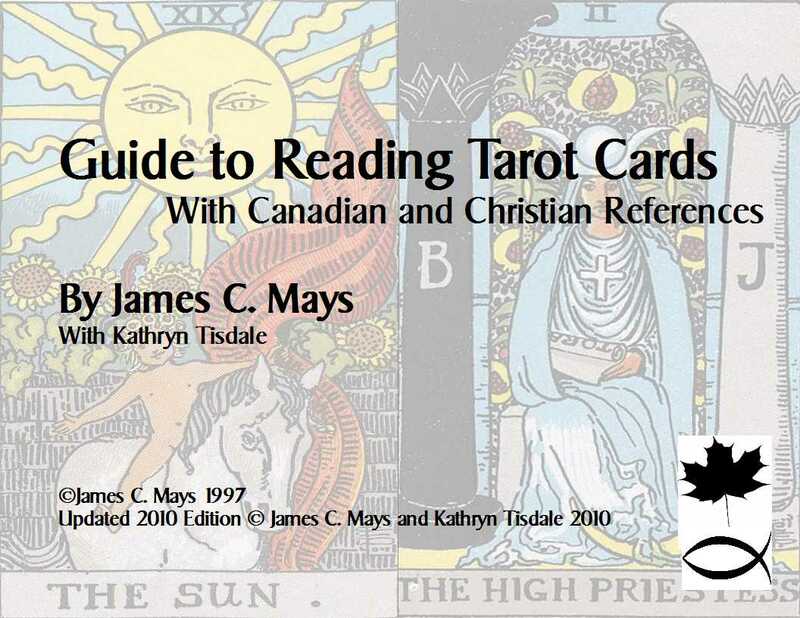 It is a guide by James C. Mays to the Rider-Waite Tarot deck with a Canadian and Christian flavour. You can find out more about it and see some sample pages at this blog site. The book is available as a .pdf download for only $5 free. Pleases check it out. This entry was tagged book, Canadian, Christian, James C. Mays, Kathryn Tisdale, Rider-Waite, sale, Tarot guide. Bookmark the permalink. The Cosmic tarot is my very first dec of tarot cards. I found those images so great and useful. It is my only dec I am using. There is so little written about The Cosmic tarot dec on internet and I am happy I found this amazing site. I have read the Cosmic Tarot deck for 25+ years. The colors and symbols allow it to be read with ease, quickly. The look in the eyes of the people on the cards speaks deeply of what the meaning of each card is. It is a wonderful deck to read with. ~ What permissions do I need to post Mr. Losche’s images in a blog? ~ Is there a list, anywhere, of the cinematic personalities used in the images?